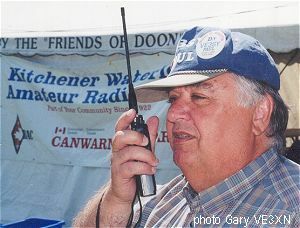 The circa 1900 Waterloo County setting at the Doon Pioneer Crossroads once again hosted the KWARC Field-Day providing excellent public exposure for Ham Radio. 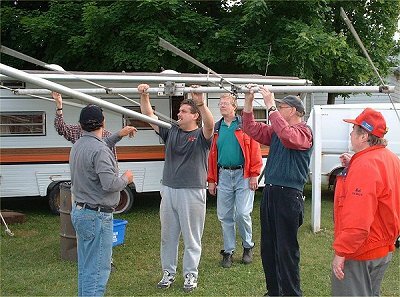 The set-up started about 7:30 Friday evening with Ben VA3BNY erecting his 60' crank up mobile tower and the 6 and 10 metre guys getting their 6 metre yagi and the 10 metre verticle ready to go when the tower was cranked up into position. The hit of the weekend though was the "Top Band" 160 metre antenna project that featured a helium filled balloon to raise a verticle antenna to 330 feet. 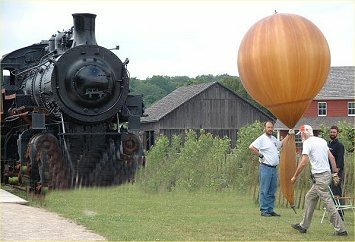 This photo shows the balloon in the early stages of inflation adjacent to the restored Petersburg, Ontario train station and locomotive display at the Pioneer Village. For a full story on the 160 metre antenna party, click here. Mark VE3THG and his wife Fay are pictured here on 6 metres. Mark was spelled off by Tedd VE3TJD although unfortunately the band did not open up as it has in previous years. 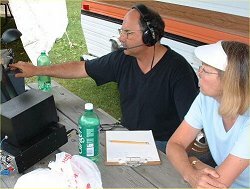 Once again this year John VE3SJV took on 10 metre SSB as a solo operator using a verticle mounted atop the 60 foot crank-up tower. Like 6 metres, propagation on 10 metres too also very poor keeping the number of contacts way down over previous years. John was hoping to also operate PSK31 however an interface problem nixed that idea as well. Jonathan VE3CBX operated 20 metres with an open wire folded full wave dipole. Jon also received some assistance from Dave VE3RBM. 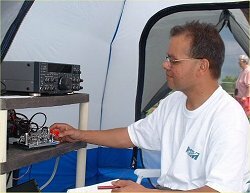 Interference from the 20 metre CW station with the 6 metre station was resolved with a tuned stub built by Don VE3ESE. 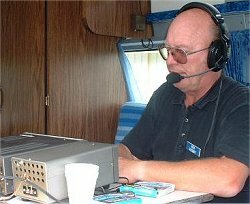 Ben VA3BNY took on 40 SSB this year with help from Paul VE3SY. and Dave VA3MRJ. The contest started with a coaxial dipole however the performance was way down so a full half wave dipole was put up which worked A1allowing the team to wrack up some 450 contacts. As mentioned above 160 metres had a great showing due to the efforts of Gord and Don erecting a full 5/8 wave verticle lifted into place with a helium filled balloon. 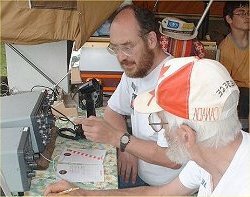 The team worked 57 contacts on 160 a new record for KWARC and a personal best for Gord. Gord was also pleased that he was able to make an "AM" contact during the contest. What field day would be complete without the great Chilli and Strawberry tart feast prepared by Eileen and Hubble Stumpf. 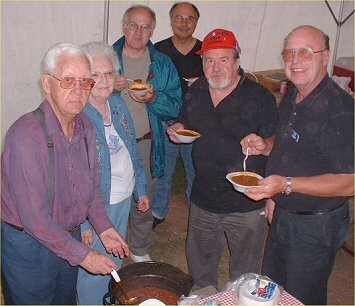 Eileen reported that this was the 10th year that her and Hubbie have been providing their secret chilli receipt to the hungry crew at Field Day. Lined up here for refills is Dave VA3MRJ, Mark VE3THG, Bob Va3MCK and Ben VA3BNY. Yum Yum! 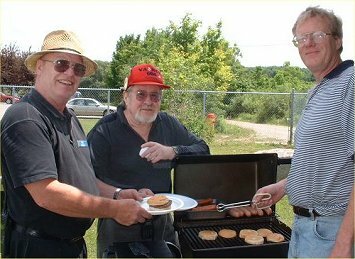 Golly - here's Bob and Ben lined up again for food this time for hamburgers served up by our Field Day coordinator Fred VE3OQB who whipped up great burgers and dog supplemented by his wife's GREAT home-made rhubarb pie. Thanks to all of the volunteers and the many visitors who stopped by to help and visit our set-up. We all hope that the Doon Heritage Crossroads facilities will be made available to us again next year. KWARC will be assisting the Village during their upcoming 1914 Communication's Day to be held Sunday July 22 this year. We will be providing equipment loaned to us from the Hammond Museum of Radio which will include circa 1914 spark equipment built by Marconi. 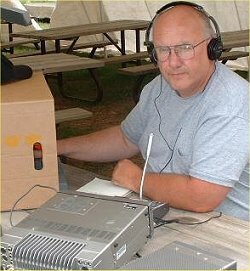 The club's IRLP node was demonstrated several times over the weekend with contacts being made by paul VE3SY with his HT with stations in Australia, Hawaii and numerous locations in the US, Canada and the UK.